New Bedford, MA – ACS/Uni-Fab™, part of Atkore International, a leading manufacturer of electrical products, announces the launch of the 10 AWG Modular Wiring System designed to supply power to every fixture down the line in suspended ceiling lighting and high and low bay fixtures. Ease of Use: Clear wiring diagrams help speed installation, making it easy to complete wiring right the first time. Components easily connect and disconnect from each other and the system features an audible click and visual confirmation when connections are made. Secure Electricity Connections & High Conductivity: Secured connections are ensured by the connectors’ proprietary pin and sleeve design, unique latch, and strike configuration. 10 AWG Flex2 – The simplest system on the market, requiring only two lighting distribution cables to supply power to suspended ceilings. 10 AWG Flex4 – Known as the industry standard for reliability, versatility, and economy, the 10 AWG Flex4 requires four basic components to supply power to suspended ceilings. 10 AWG Flex3 – Single-pass installation of three components saves time on the job. 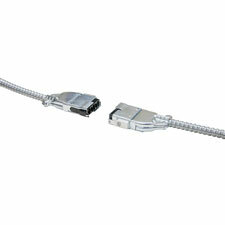 10 AWG Flex3+– Double-ended connectors allow you to easily disconnect and remove lighting fixtures without disturbing power downstream. 10 AWG Luminary Flex3+C – Double-ended connectors and a whip end extender fixture drop enables the removal of a particular fixture without interrupting power flow. 10 AWG Luminary Flex4C – Deliver locally or panel-controlled branch circuit power through accessible ceilings. A versatile Extender Cable component is used to extend the length of other cables and carry branch circuit power and 1-10V controls between the Lighting "T”. The 10 AWG wiring systems are available in multiple configurations, UL and CSA Certified, and compatible with existing 10 AWG systems. For more information, view the AFC/Uni-Fab 10 AWG brochure here.